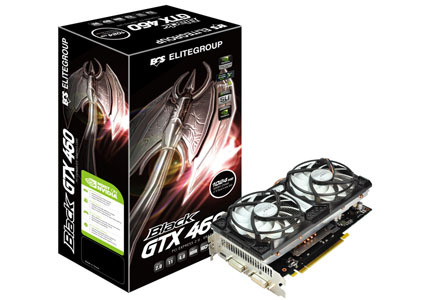 ECS Elitegroup is a manufacturer that has been around for a while and has recently been making great strides to appeal to the enthusiast community with their “Black” series of components which bring premium performance and cooling at a great price. The video card we have here today from ECS is their GeForce GTX 460 1GB Black which is factory overclocked to a respectable 765MHz core speed and even comes with the Arctic Cooling Accelero Twin Turbo heatsink for maximum overclocking! Looking at the chart, the primary differences between the 1GB and 768MB GTX 460’s are tied to memory and bandwidth; of course, you can’t forget the 768MB versions have less ROP engines. Today’s testing will involve the HD 5670, 5750, 5770 and, of course, the GTX 460 1GB from ECS. I would have liked to have included the GTS 450 and 460 768MB, but those shall come in due time (maybe not the 768MB) because I simply do not have them on hand. Also, note the Radeon HD 5830 should be mentioned at the $199 price point, though is still over-valued in relation to the HD 5770 which performs close to it.